As the days become shorter and chillier, we begin to crave heavier foods. Lasagna is a hearty dish, and many people associate its richness with meat and cheese. Often, when they first go vegan, they’re afraid they’ll need to give up familiar comfort food. That’s not the case with this lasagna! It’s jam-packed with flavor, due to the addition of vegan ricotta, vegan “meat” crumbles, and creamy nut cheese topping. If you serve the dish to your meat-and-dairy-eating pals and don’t tell them it’s gluten-free and vegan, they will never figure it out on their own. It takes a while to make, but the wait is well worth it. You’ll be delighted by the results! 1 10-oz package gluten-free lasagna noodles (we especially like De Boles Rice Lasagna, but any gluten-free noodles will do). 1 8-oz container vegan ricotta (Kite Hill is the absolute bomb, but there are others). 1 cup Vegan Crumbles (You can use soy, but check the package, as many brands add soy sauce, which contains wheat. Our favorite vegan, gluten-free crumbles come from Beyond Meat and are made with pea protein). Prepare noodles according to package instructions. Mix tomato paste with 5 cups water and place in crockpot or large pan. Gradually add crumbles, chopped roma tomatoes, garlic, basil, oregano, and other spices. Toss a splash of olive oil into the mix for additional flavor. Simmer for 1-2 hours (longer in crock pot). When the sauce becomes thick and aromatic, you’ll know it’s done. Your entire house will smell wonderful. Spread a thin layer of olive oil in a large baking pan. Place a layer of noodles inside the pan and spoon the ricotta liberally across their surface. Layer with spinach, sauce, more noodles, more sauce, etc, until pan is full. Sprinkle the vegan cheese across the top and garnish with additional chopped basil, oregano, etc. Bake in oven at 350 degrees for 50-60 minutes. For best results, add a homemade, tossed salad and some gluten-free garlic bread. Your incredible dish will serve 4-6 people, depending on everyone’s appetite. 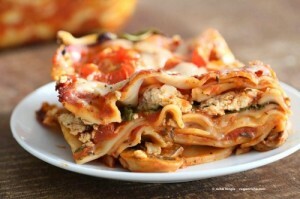 You’ll want to make this amazing lasagna again and again!